THE Highland home to a trio of festivals has won out in a ‘David versus Goliath’ competition to choose the Best Unusual Venue in Scotland. At the Scottish Event Awards last night, Bogbain Farm in Inverness was declared the Best Unusual Venue in Scotland, fighting off stiff, and more luxurious, well-established competition. The awards ceremony took place at the Glasgow’s Radisson Blu Hotel and was held in association with EventScotland. 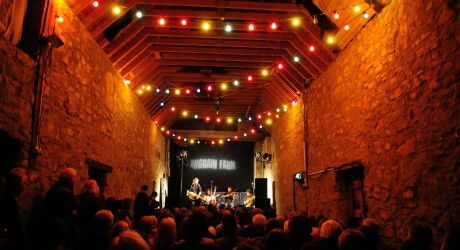 Bogbain Farm, which has gone through major changes since last year, was described as being in an unique location and hosting innovative events by the judges before the venue was eventually declared the winner. It organises three festivals – The Inverness Whisky Festival, Brew at the Bog (sponsored by BrewDog) and the Northern Roots Music Festival - and is run by Northern Roots Events, a company managed by BBC Radio Scotland and Blazin’ Fiddles star, Bruce MacGregor, alongside Young Highland Ambassador 2011, Yvonne Murray. Ms Murray – who is originally from Stornoway – collected the award on Thursday, said: “To win an award like this is absolutely fantastic – we are ‘over the moon’ that our hard work over the last year or so is paying off. “It’s very clear that the direction of our new company is much better suited to the buildings than what went before, and I’m delighted to be leading the charge with Bruce in creating a very special venue for Scotland. Bogbain Farm is an 19th-century farm building 2 miles south of Inverness on the A9. It boasts original features such as a cobbled floor, stone walls, high ceilings as well as quirky additions such as a saloon bar – which was knocked together for less than a tenner – together with a cocktail lounge, an accordion collection and a recording studio. Previously a children’s activity centre run by another company, Northern Roots Events took over the establishment in 2011 which now looks after the festivals, concerts and private hire functions run at the award winning venue. Bogbain’s first wedding ceremony takes place in a few days time, with multi-award winning Welsh sensation, Charlotte Church, gracing the Barn stage on October 20th with her new band. MEDIA RELEASE posted by Bogbain Farm. You too can post media releases (aka press releases) on allmediascotland.com. For more information, email here.